"class_raster" are numeric values which should be transferred in the raster. "Size is 6570, 3250"                                                        "Coordinate System is:"
 "        DATUM[\"North_American_Datum_1983\","                              "            SPHEROID[\"GRS 1980\",6378137,298.2572221010002,"
 "Origin = (265380.523957236320000,5081957.489292523800000)"                 "Pixel Size = (30.000000000000000,-30.000000000000000)"
 "Image Structure Metadata:"                                                 "  COMPRESSION=LZW"
 "Upper Left  (  265380.524, 5081957.489) ( 74d 0'28.08\"W, 45d52'34.80\"N)" "Lower Left  (  265380.524, 4984457.489) ( 73d59'59.97\"W, 44d59'56.44\"N)"
 "Upper Right (  462480.524, 5081957.489) ( 71d28' 9.73\"W, 45d51'33.89\"N)" "Lower Right (  462480.524, 4984457.489) ( 71d30' 2.06\"W, 44d58'57.36\"N)"
 "Center      (  363930.524, 5033207.489) ( 72d44'39.21\"W, 45d26'10.68\"N)" "Band 1 Block=6570x1 Type=Float64, ColorInterp=Gray"
 "  Min=1.#IO Max=-1.#IO "                                                   "  Minimum=1.#IO, Maximum=-1.#IO, Mean=1.000, StdDev=1.000"
 "  NoData Value=-1.6999999999999999e+308"                                   "  Metadata:"
I have the version 1.0-7 of rgdal. I cannot recover your error but it seems that the parameters b=... l=... for band and layer are not present and I don't know what is in your data field a=class_raster, may be it is not a numeric type that fits into the raster band, that you want to fill with these data or NA could also be a problem. Here a little how to, I use to test the gdal_raster in GNU-R (also new for me ..but interesting), may be you can adopt something to get your stuff running. Normally I use the gdal utility at command line under LINUX. 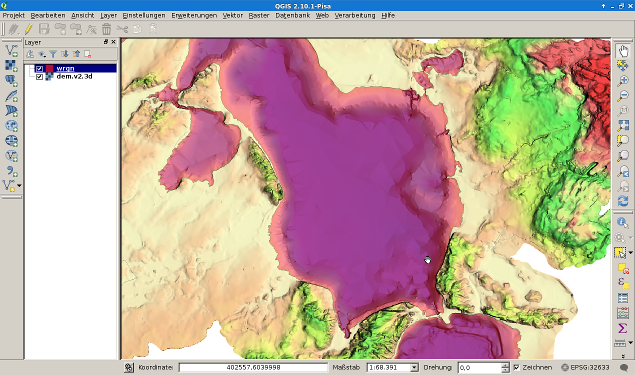 I made a screen shot of qgis with a 50% reduced screen size for upload. I zoomed a little bit in, so that you can see the underlaying bathymetry, which should get dark blue in the next step . In the R script I use a copy of the dem.v2.3d.tif called test.tif and will blank the water area with the param set ...b=c(1,2,3), burn=c(0,0,128)... (for a dark blue color). I get this result as expected.. So every thing seems to be fine when I work under a LINUX amd64 environment, DEBIAN Jessie, R Version 3.1.1, gdalUtils 2.0.7.1. on an T410. Conclusion: You could make some tests with parameters b=... l=... for band and layer and a burn=... param and later go on to use the a=... param. I'm not sure which version of gdal you're using, but if it's older than 1.8, you have to create the tiff with a proper extension and resolution before you use it. The GDAL supported output file. Must support update mode access. Before GDAL 1.8.0, gdal_rasterize could not create new output files. Not the answer you're looking for? Browse other questions tagged raster r rasterization rgdal gdalutils or ask your own question. 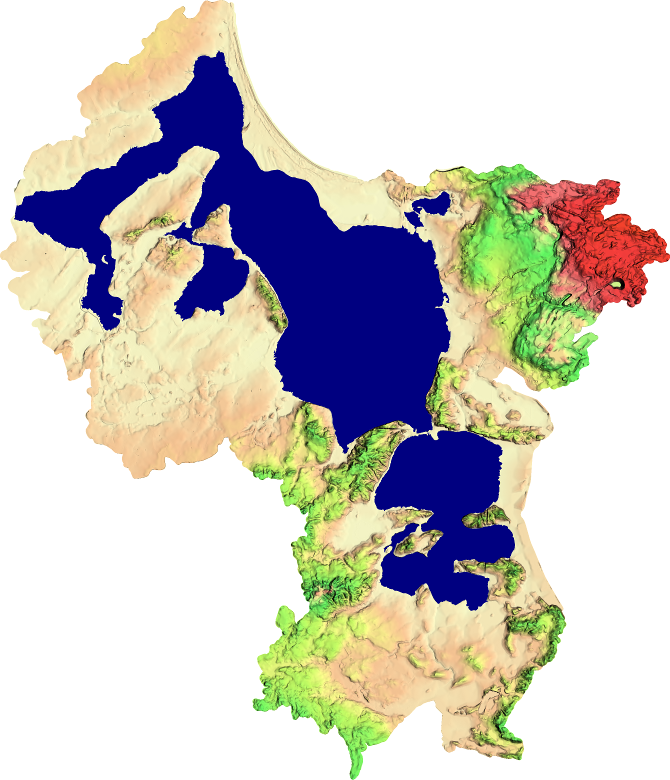 Scaling two rasters to same elevation scale in QGIS?